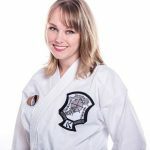 Jesalyn Mae Harper is an owner and instructor at Double Dragon Kenpo Karate and runs an online blog called, “Kenpo Girl”. Kenpo Girl is dedicated to discussing issues in all systems and styles of martial arts, on and off the mat. Sifu Jesalyn is also an MMA freelance writer and a published author.